This classic dessert from the island of Corsica is basically a rustic crème caramel thickened with a bit of fine semolina flour. While doing recipe research, I discovered versions that used day old bread or even cous-cous for the thickener. I think that this version works the best. U Pastizza pairs very well with fresh fruit, especially stone fruits like peaches and apricots, or with berries. 1. bring milk to a boil, then add the vanilla beans that have been split and scraped and the lemon zest. Infuse for 30 minutes off the heat. 2. While the milk is infusing, make a dark caramel with the sugar. Once dark golden brown, quickly mix in water then pour in to a pie pan. Set the pan aside to cool. 3. Remove vanilla beans from the milk, add the sugar and reheat. Once boiling, whisk in semolina and boil for 3 minutes, whisking constantly. 4. Let cool slightly then slowly whisk in to eggs which have been beaten in advance. Pour in to pan and bake in a water bath covered in foil for around 50-60 minutes. Cool. 5. Next day run knife along edge on pan and turn on to a serving dish. Cut into 8 slices. 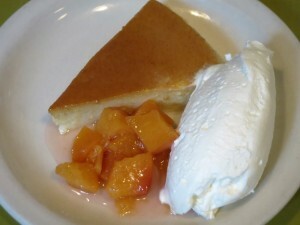 This entry was posted in Desserts and Sweets and tagged Corsica, desserts. Bookmark the permalink.